Follow the Route of the Sea along the Pacific coast of the “Thin Country” on this journey into the heart of Chilean culture, admiring sweeping vistas, glimpsing penguins and sea lions, and joining local fishermen at their work. 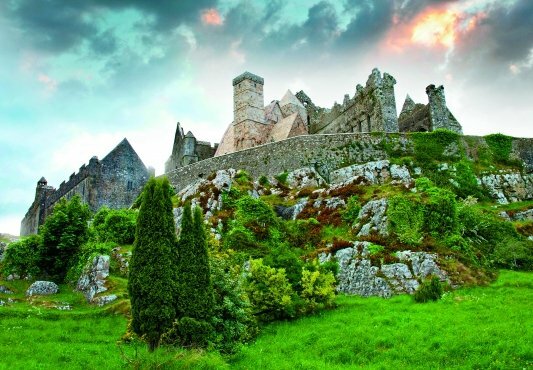 You’ll also venture inland, cycling through ancient forests and groves of eucalyptus trees, and exploring towns and cities renowned for their unique architecture and ambiance. Along the way, you’ll sample local wines—and even craft your own blend—while also mingling with the people who call this region home. 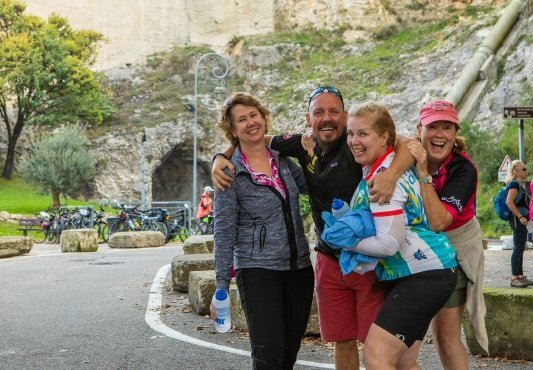 This tour offers easy terrain and short mileage rides throughout, and is ideal for beginner cyclists. Longer mileage options with easy-to-moderate terrain offer fun for more avid bikers with rides in the afternoons. Many of the scenic coastal rides are on primary roads with traffic. Our VBT support shuttle is always available for those who would like assistance with hills or do not feel comfortable with some of the more heavily trafficked roads. In order to provide a variety of scenery and rides, there is considerable shuttle transfer time required on this tour. Transfers can range from 45 minutes to 2.5 hours. If you choose to add on the post-trip extension to the Atacama Desert, you will experience elevations ranging from 8,000 feet to 13,000 feet. 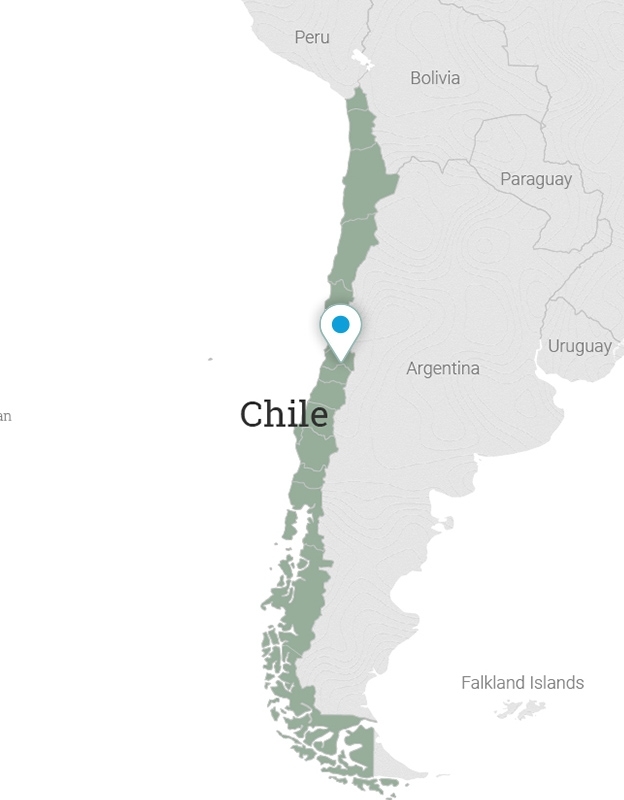 Depart from home and travel to Chile. The particulars of your arrival overseas are detailed with your flight itinerary. Upon arrival at Santiago’s International Airport, proceed to immigration for passport control. You will be given an immigration document that you will need to keep with your passport during your stay in Chile. Upon departing Chile, you must return this document to the immigration officer, as it is an official means of monitoring your entry/departure dates in Chile. After clearing immigration, claim your luggage and clear customs. Please note that Chile is very strict with the importation of any fruits or vegetables and imposes strict fines for illegal importation of food items, so ensure that you have eaten or disposed of any foods prior to clearing customs. If your luggage is delayed, fill in a PIR form before leaving the customs area—VBT representatives are not allowed into the customs area. Please make certain that your VBT luggage tags are affixed to your bag so your VBT representative can identify you. After exiting customs, enter the arrival hall, where your VBT representative will be holding a VBT sign and will make arrangements for your transfer via van to your Santiago hotel. Transfer time is approximately 30 to 45 minutes, depending on traffic. If for some reason you cannot find your VBT representative, please ask the airport information desk to assist you in calling the VBT transfer company for assistance. The transfer company is Turismo Sikleta, and the 24-hour emergency telephone number is (+56) 9 95450529. VBT provides you with City Information that includes recommendations on what to see and do in Santiago. You have the rest of the day free to relax or explore. 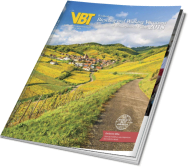 VBT Pre-Trip Extension and Air Package guests: Meet one of your VBT Trip Leaders at The Singular Santiago hotel at 8:45 a.m. When you depart the hotel this morning, please be dressed in your cycling attire for your warm-up ride. You will shuttle (approximately 1.5 hours) to the starting point of your warm-up ride, where you will meet your second Trip Leader. Leave the hustle and bustle of the Santiago metropolitan area and shuttle northwest toward the Pacific Coast. 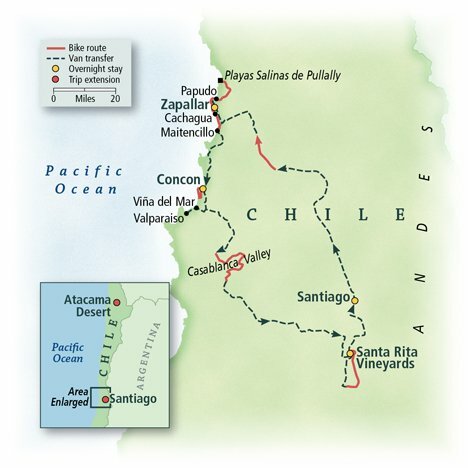 Crossing the coastal mountain range, you’ll travel through the agricultural heartland of Chile. The Mediterranean-like climate of Chile’s central region is ideal for growing avocados, peaches, walnuts, olives, almonds, citrus fruits, flowers for export and, of course, grapes for producing the country’s excellent wines. Your warm-up ride immerses you in this farming landscape on a scenic and seldom-traveled country road. Following your ride and lunch, continue your journey with a shuttle (approximately 1 hour) to the quaint coastal fishing town of Zapallar and your charming inn overlooking the Pacific. You’ll meet tonight for a cocktail reception before enjoying a delicious welcome dinner at the hotel. Following breakfast, you’ll depart the hotel on your bike for a morning ride along Chile’s scenic Ruta del Mar, or Route of the Sea. Enjoy the marvelous vistas as you travel along Chile’s central coast. Later, turn off the Ruta del Mar and follow a narrow paved road past small farms to Playas Salinas de Pullally. This beach derives its name from the salt dunes that attracted indigenous populations in the past. Today the beach is a refuge to surfers and kayakers. There’ll be time to explore before you enjoy your included box lunch. Following lunch, cycle on an easy, quiet rural road before shuttling back to your hotel (approximately 40 minutes). For those looking for a longer ride this afternoon, you may opt to continue on a longer and scenic route to your hotel. Please note: There will be heavy traffic on the coastal Ruta del Mar during the summer months of January and February, which could cause longer transfer/shuttle times and less desirable riding for guests opting for the longer afternoon ride option. Upon returning to the hotel this afternoon, relax in the hotel’s pool or venture down a hillside path through tall pines to walk along the seaside La Rambla, a series of stone walkways built around giant boulders along the coast. Nearby, you’ll come upon a popular beach where you may join local residents sunbathing and swimming in the calm waters of a horseshoe-shaped cove. This evening, enjoy dinner at your leisure at your inn’s small restaurant or on the outside terrace. Or you may opt to walk along the scenic La Rambla to a seaside restaurant where you may sample the fresh seafood caught daily. This morning, you set off on your bicycle to explore Zapallar. Zapallar’s history explains the appeal of this quaint seaside town. The village was settled more than 100 years ago by an affluent Chilean who wanted to develop a modest South American version of the French Riviera. He offered land to his affluent friends and relatives with the condition that they build within a couple years, which they gladly did. Descendants of the original families still own many of the homes, but only the very rich can afford to live in what some have called “The Hamptons of Chile.” Today, this elite town boasts lavish homes with impeccable flower gardens. 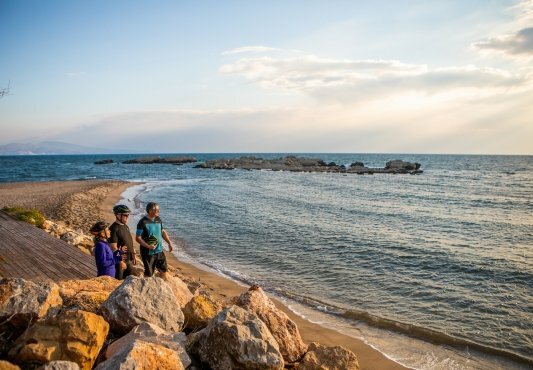 You’ll cycle from your hotel to Zapallar’s small fishing port. Fisherman still work as they have for centuries here. Join some of them as they venture out to sea in their small boats. Help collect traps with crab and possibly the rare rock shrimp found only in these waters. 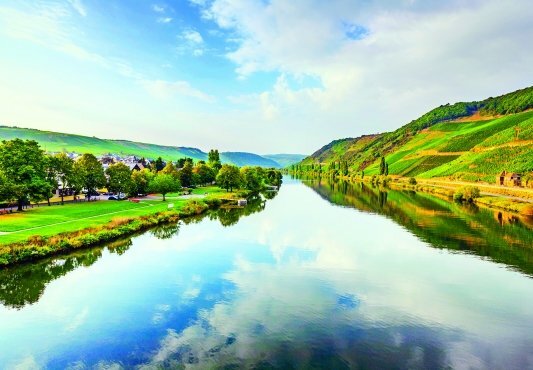 Back on land, you’ll continue your morning cycling amid the winding streets lined with cypress and eucalyptus trees, stopping by one of the most famous houses, named “Hildesheim,” after the name of a German town. This charming house is a perfect replica of a Bavarian house from the 16th century. Continue your ride to Cachagua, a small seaside town south of Zapallar famous for its Humboldt penguins. In the past, local people and fishermen protected and fed the penguins that migrated here after they were injured or got lost from their colony. Today, this is one of the few Humboldt penguin communities left in South America. This unspoiled island sanctuary is one of Chile’s treasured national parks and home to thousands of Humboldt penguins and other birds. Your ride will lead you to the beach to see this tiny island, which is a short distance offshore. Don’t forget your binoculars for a more up-close observation. You’ll then continue your ride to the south to reach Maitencillo, a very active destination where you’ll see surfers, paragliders, cyclists, joggers and skaters. Here, you’ll stop for lunch on your own and a chance to sample helado, ice cream, or a cerveza, beer, in one of the many local kiosks on the beach. Then, continue your trip on the shuttle (approximately 1 hour) south along the Pacific Coast highway to your next destination, Concon. Your unique seaside accommodation is partially built into huge stone boulders, providing all of the rooms with spectacular ocean vistas with crashing waves below. Dine on your own by the marina of Concon, or enjoy seaside dining at your hotel. Take a leisurely morning ride from your hotel this morning. Enjoy the sound of the crashing waves as you cycle along a lovely coastal route to a site where sea lions, fed and protected on a small island by the Marine Biology University of Valparaiso, sunbathe on offshore rocks. Don’t forget your binoculars for a more interesting observation. Then, arrive at Reñaca beach, one of the famous beaches of Viña del Mar, and explore the area before biking back to the hotel. You will have the chance to stop for an outstanding photo opportunity of the huge sand dunes of Concon. Later this afternoon, shuttle (approximately 45 minutes) to one of Chile’s most vibrant cultural centers, Viña del Mar. This seaside city hosts an annual International Song Festival and an International Film Festival that is considered one of the most important in Latin America. The town is known as the “Garden City,” as you’ll see upon your arrival to the Reloj de Flores—a large clock made of flowering plants. From here, you will walk to the local metro stop to take the metro into the next town, Valparaiso. Valparaiso is a major Chilean port and was a popular stopover for late-19th-century ships sailing from the Atlantic to the Pacific Ocean through the Straits of Magellan. The city also supported and supplied the California Gold Rush of the 1850s. 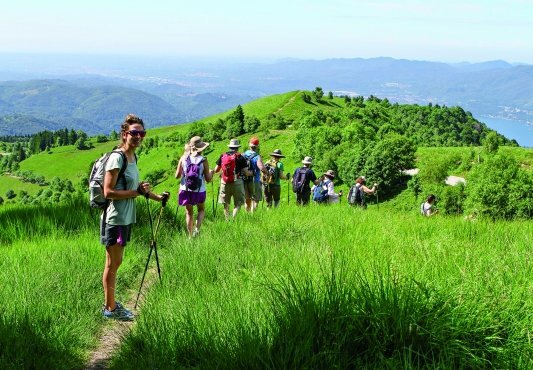 Declared a UNESCO World Heritage Site due to its unique urban design and distinctive architecture, its cobblestone alleyways and hillside buildings are the focus of your walking tour today. You’ll pause to enjoy some free time to browse the tiny boutiques and art galleries and to enjoy dinner on your own in one of the city’s restaurants overlooking the port. This morning, you’ll leave the cool coastal climate and travel inland (approximately 1 hour) to the Casablanca Wine Region. The valley is relatively new to wine growing, as the grapes were planted as recently as the 1980s, but the region is widely known for its white wine grapes, especially Sauvignon Blanc and Chardonnay. 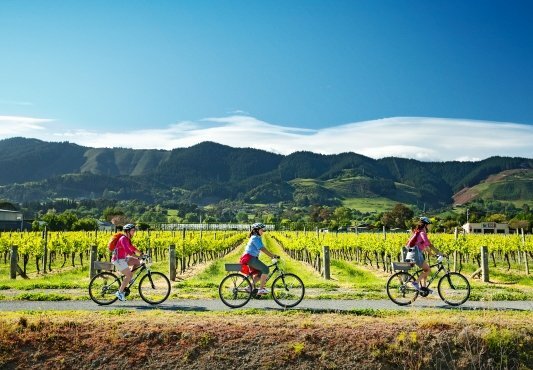 Your ride today traces shaded roads through eucalyptus forests to expansive vistas of vineyards and olive groves. 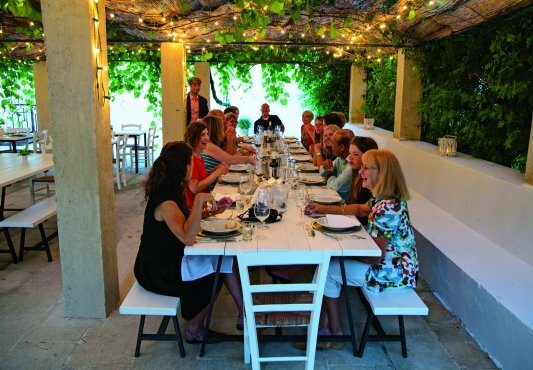 You’ll be rewarded with a tasting of some of the region’s wines and a sumptuous picnic lunch at the fifth-generation American-Chilean Kingston Family Winery. After lunch, continue inland to the foothills of the Andes (transfer time approximately 2 hours, depending upon traffic). Your home for the next two nights is the regal Hotel Casa Real, surrounded by the Santa Rita vineyards, which have been making wine since 1880. With only 16 luxurious rooms, this Tuscan-inspired villa will be exclusively yours. After settling into your accommodations, this evening you’ll be treated to a welcome reception on Casa Real’s veranda, followed by a gracious candlelit dinner served in the villa’s intimate dining room. After breakfast, begin your ride through the Santa Rita Vineyards. Your scenic morning follows country roads flanked by magnificent ancient trees. You’ll pass local farmers in their ponchos, many still using horses as their means of transportation. Feel free to stop and sample delicious pan amadado, homemade bread, and fresh empanadas, savory turnovers, along the way. You’ll share a picnic lunch at the end of your ride. Later, shuttle (approximately 45 minutes) back to Casa Real, where you may tour the impressive Museo Andino, or Andean Museum, located just steps away in the vineyard. The museum houses more than 1,800 pieces of art from several Andean cultures, as well as artifacts from as far away as Easter Island and the Atacama Desert. Or you may enjoy a relaxing swim in the pool or a stroll through the expansive gardens, where you can admire the second-tallest bougainvillea in the world, or walk through the Santa Rita vineyards to the monument marking where the “lost Carmenere grape” was recently discovered. In 1863, the phylloxera aphid invaded European vineyards, destroying all the grapes by 1870. However, European vinifera was grafted to American rootstock, which was impervious to the insect, and eventually the European vineyards bounced back. The Carmenere grape was thought to be lost forever until it was discovered in 1994, here in Santa Rita’s vineyards. Later, you’ll learn about blending wines from an expert Santa Rita sommelier. Create your own wine blend to your specific palette’s desire. Your concoction will be bottled and labeled as your very own. Afterward, you’ll be treated to a typical Chilean barbecue for a festive farewell dinner on the lovely patio of the Casa Real (weather permitting). VBT Air Package guests: This morning, you’ll transfer (approximately 45 minutes) to Santiago for a walking tour of La Vega, Santiago’s Central Market. Lunch is on your own here, so you can follow your own whims. Later, you’ll transfer to the Holiday Inn Santiago International Airport, where a dayroom is provided until you depart for your overnight flight home. VBT Post-Trip Extension guests: After breakfast, transfer to the Santiago International airport for your flight to Calama airport in the Atacama Desert. Your flight schedule does not allow you to participate in the Santiago’s Central Market walking tour. After you collect your luggage in Calama and exit the luggage area, a VBT representative will meet and assist you to your accommodations in San Pedro de Atacama. Travel time from the Calama airport to San Pedro de Atacama is approximately 2 hours. Take the remainder of the afternoon to adjust to San Pedro’s 8,000-foot altitude before enjoying dinner on your own at the hotel or in town. Please note: Your post-trip extension includes all excursions detailed in the itinerary. To maintain VBT’s excellent value, you might be joined by non-VBT guests during your transfers and excursions. All guests: Please note: VBT transfer times and departure points are finalized in advance and cannot be modified for individual guests. If you extend your stay beyond the scheduled program dates, return transportation to the airport will be at your own expense. Flights arrive home this morning, allowing for connections to your home city. VBT-Bicycle-Vacation-only guests: Meet one of your VBT Trip Leaders at The Singular Santiago hotel (Merced 294, Santiago; telephone (+56) 2 230 688 00) at 8:45 a.m. Please contact the hotel to advise them of any travel delays or changes, so the staff can alert your Trip Leaders. When you depart the hotel this morning, please be dressed in your cycling attire for your warm-up ride. You will shuttle (approximately 1.5 hours) to the starting point of your warm-up ride, where you will meet your second Trip Leader. This morning, transfer to Santiago for an included walking tour of La Vega, Santiago’s Central Market. After the tour and lunch on your own, you’ll transfer to the Santiago airport, where your tour concludes at 3:00 p.m. Departure flights prior to 6:00 p.m. are not recommended; you will need to make your own transfer arrangements to the airport if you have an earlier departure. The Radisson Acqua Concon & Spa enjoys a stunning location, set among dramatic seaside boulders. Attractive sea-view rooms are generously outfitted with all the modern amenities, including complimentary Wi-Fi, flat-screen televisions, free bottled water, and spacious desks. The hotels roof terrace offers outdoor sunbathing by its intimate pool. On cooler days, enjoy the indoor pool carved into the hotels rock foundation. During your stay, treat yourself at the Acqua Spa and soothe body and mind with an indoor seawater pool and a selection of massage services, beauty techniques, and skin treatments. This Tuscan-inspired hotel is nestled in a beautiful natural environment just 45 minutes from Santiago. Located in the heart of a century-old, 120-acre park, the regal hacienda is imbued with the history and traditions of the Santa Rita Winery. The park is home to the second-tallest bougainvillea in the world, as well as numerous gardens and paths for tranquil walks. You might also relax in the small swimming pool and pool house. The haciendas small chapel was restored by a craftsman from the Vaticans Sistine Chapel. As the villa has just 16 rooms, you have the entire place to yourself. The only hotel located within the Santiago Airport, the Holiday Inn Express is a perfect spot for a dayroom to rest up and refresh prior to an overnight flight to the U.S. The hotel offers full services with a restaurant-bar, free WiFi internet access throughout, a gym, heated indoor pool, Jacuzzi, and sauna. The entire hotel is non-smoking, and the spacious rooms offer either king or twin beds. The Singular Santiago, a blend of early-20thcentury and neoclassical French architecture, enjoys a central location alongside the green inviting Parque Forestal. The trendy restaurants and cultural sites of the Lastarria district are also right outside your door. Sip wine or cocktails in the rooftop bar and savor dazzling views. Enjoy exemplary dining in the restaurant. And admire the cityscape from the elevated terrace or the rooftop pool. Visual and performance arts are just a short walk away at the Museum of Fine Arts, the Museum of Visual Arts, the Gabriela Mistral Center, and other institutions. Hotel Isla Seca is a unique, European-style boutique hotel that reflects the history of Zapallar. This 4-star luxury property has stunning ocean views and offers first-class service. The hotels restaurant has an exquisite menu prepared from fresh and local ingredients. Rooms are decorated in a classic and cozy style; 400-thread-count cotton sheets, lush pillows, and French amenities are just a few of the special touches you will enjoy. The hotels location puts you a short walk away from the nearby coastal path that leads to Zapallars beautiful swimming beach. Discover some of the highlights of your hotel’s barrio, or neighborhood, this morning. 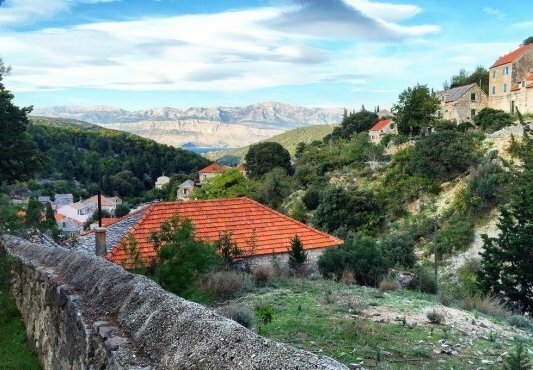 A short stroll away, explore historic Santa Lucia Hill where Spanish conquerors established the city in 1541. Just a block away, enjoy leisurely strolls through the verdant urban park Parque Forestal bordering the Mapocho River. This evening, you may dine either at your hotel’s renowned restaurant or at any number of nearby neighborhood restaurants. Continue your exploration of Santiago today. You may want to see this cosmopolitan city by bicycle on an organized tour, pedaling through its green parks and bicycle-friendly avenues. Or visit any of the numerous museums and historical sites that make Santiago one of South America’s most-visited cities. Tonight, you might venture out to experience the city’s nightlife in the neighboring barrios of Providencia or Bellavista. Archeological tour; visits to Quitor, Tulor and Machacu villages; Moon and Death valleys excursion; and excursions to Toconoa, Atacama Salt Flats, Los Flamencos reserve, and Miscanti and Minique lagoons. After breakfast, transfer to the Santiago International airport for your flight to Calama airport in the Atacama Desert. Your flight schedule does not allow you to participate in the Santiago’s Central Market walking tour. After you collect your luggage in Calama and exit the luggage area, a VBT representative will meet and assist you to your accommodations in San Pedro de Atacama. Travel time from the Calama airport to San Pedro de Atacama is approximately 2 hours. Take the remainder of the afternoon to adjust to San Pedro’s 8,000-foot altitude before enjoying dinner on your own at the hotel or in town. After breakfast today, you’ll begin your extensive exploration of this fascinating region of Chile, starting with an archaeological tour of the pre-Columbian villages of Quitor and Tulor. Continue to the lunar-like landscapes of the Moon and Death valleys, declared a Nature Sanctuary even though they comprise one of the earth’s most inhospitable places. You’ll marvel at astounding geological phenomena here, from enormous mineral sculptures to jagged crests formed by the wind over millennia. Continue your exploration of San Pedro on your own this evening. You’ll spend all day today traversing more of the Atacama. Visit the Miscanti and Minique lagoons with their salt-encrusted banks. Then, further explore the Atacama Salt Flats, home to various breeds of flamingos. Halfway through your day, you’ll break for an included lunch. This morning, you may enjoy a leisurely morning exploring the village of San Pedro de Atacama for any last-minute souvenirs, or simply relax poolside at your lovely hotel. Later, transfer to the Calama airport (approximately 2 hours) for your return flights to the Santiago International Airport. Upon arrival, you’ll connect for your overnight flight home. 9 days, includes round-trip international airfare, airport shuttle, and additional hotel nights with included breakfast.